I hate the Jimmy Saville revelations, with a passion. In revealing how he behaved and shattered the lives of people who trusted him and looked up to him, he shatters memories and illusions of goodness to others that were part of my childhood, making the world a worse place. Part of me wishes that this had never come out, but then what justice would the victims have if it was forever buried? Every part of the good works that Saville was involved in is now tainted, and what legacy he left is turned to corruption and abuse. Plus it allows the BBC to obsess about its favourite subject, the BBC. The brilliant Peter Capaldi as Malcolm Tucker - you really should buy the DVD of this series! I was late in discovering the BBC’s The Thick of It, mainly as the few times that I had stumbled across it flicking channels I'd usually landed in the middle of one of Peter Capaldi's brilliant swear-word filled tirades as Malcolm Tucker, the government's Director of Communications. Landing in the middle of one of these is not something that really endears the programme to you, and I dismissed it as loud and swear-y rubbish passing as comedy. However, I ended up catching the first episode of Series 4 on TV one night – from the start – when Jill and the boys were in bed. I was hooked, realising that this was one series that you couldn't just drop into mid-episode. I've watched each episode since, through a variety of means (time shifted on PVR, iPlayer and live), and they have been gloriously full of swearing, politics and – in far too many ways – believability. I'm really sad that last night saw the final ever episode, dealing with the aftermath of the Goolding Inquiry (think spoof of Leveson) on leaking, and the demise of Malcolm Tucker. However, now I have the DVDs of the first three series and specials to enjoy as a guilty pleasure and to compensate for the loss of this brilliant show. Contrary to my original thoughts, this is a fantastic counterpoint to Yes, Minister and Yes, Prime Minister. 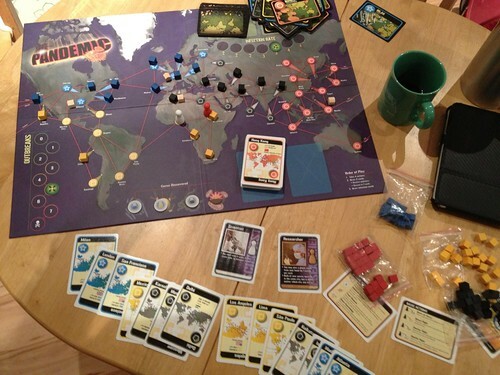 I picked up a copy of the boardgame Pandemic at Furnace and as I had a quiet night with Jill out and the boys asleep, I decided to give it a quick go to see how it works. 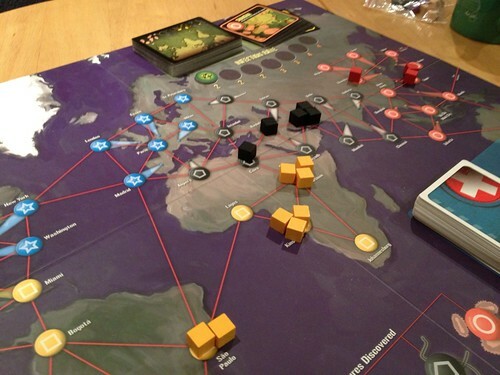 The premise of the game is quite simple; the world is suffering from a pandemic event with four diseases potentially running wild. Each player represents an agency or researcher with special skills that can help defeat the outbreaks of disease. The game can handle 2-4 players and lasts around an hour. The components are of good quality, with a nice solid board and wooden pieces. The cards seem durable with a linen effect that gives good grip. I tried a two player game on the lowest difficulty level and was thoroughly trounced! It started well, with no outbreaks in Europe, and a small outbreak in South East Asia. Africa was the worst area , with some threats looming in the Middle East. The disease outbreaks are represented by wooden blocks of different colours, and each location can have a maximum of three of each type. At the start of the game, three cities have 3 blocks, three have 2 blocks and (you guessed it) three have 1 block.These are determined by the draw of infection cards, which are then placed on the discard pile. Each card shows a city and a disease colour, determining where the next infection is. If you run out of infection blocks to play for a colour at any time the players then lose. The mechanics are joyously simple. Each city is connected to the others in a web that dictates travel and the spread of disease. Every turn you take 4 actions, which can range from travel through to passing cards to other players, building research centres, finding the cure and healing disease. If you have a cure, you can wipe out a disease completely at a location, otherwise you can reduce it by one block. After taking actions, you draw two more player cards. These show cities and related disease colours. You need a research station of 5 cards of the right disease colour to find a cure, unless you're the scientist role, in which case it's only 4 cards. There are also special event cards (for example money to build a research station for free) and epidemic cards. Epidemic cards are nasty. They are dealt into the player card pile with between 4 and 6 in play depending on the challenge level you want. I played the introductory version with four cards. If you draw one, the rate of infection cards you draw each turn can increase (see next bit) and a city gets infected to the point of outbreak (ditto) which is really quite nasty. Finally, all the discarded infection cards (i.e. 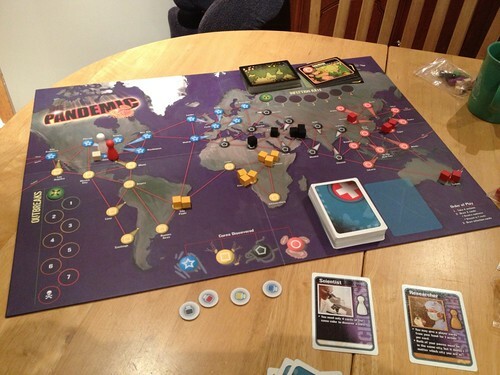 cities that are already infected) get reshuffled and placed on the top of the infection draw pile so you can be infected in the same points again, raising the intensity of the game. The only respite is if you have eradicated a disease completely, in which case no new disease blocks can be played. If you run out of player cards, you lose as well. The infection stage is quite nasty. You draw a number of infection cards which show the cities that gain a single extra block. Unless they already have three blocks of the same colour in which case the disease 'outbreaks' and all adjacent cities gain a block of the disease. This can result in a cascading chain reaction, which is only limited by the fact that each city can only be infected once. If you have eight outbreaks, you lose. I quickly found the cure for the South East Asian outbreak, and for Europe, but Africa and the Middle East were proving more elusive. You very quickly get a feeling of quiet desperation as, even with the cure, you can only normally cure two adjacent cities per turn with the action limit. If you get a few adjacent cities with 3 blocks the same colour it feels really, really bad. It also feels great when you draw an infection card for a disease you've eradicated, so nothing happens. I had beaten the European plague back, and done enough to slow the Middle Eastern Outbreaks, and was focussed with both players on eradicating the African and South American infection (maybe the hardest?) when I ran out of player cards, thinking I'd lost. It was only as I was packing away - thinking how hard, but how addictive the game was - that I realised that I'd actually won by finding all four cures. I really like this game, and look forward to playing it with friends. I can imagine that it could be a little frustrating and hard, but it gives quite a buzz! Despite being one of the troika organising the convention, I managed to miss the fact that we'd opened the slots for GMs, only finding out when our efficient and glamorous Gaming Tsar Elaine asked me why I wasn't running. I ended up with a single slot booked, rather than the two to four that I have run in other years. However, as people dropped out from running and/or attending, I gradually accreted more slots until I hit four once more. I tend to use Furnace as an opportunity to playtest material for publication, so ended up taking three Wordplay scenarios; two for my Singularities RPG, and one for the new Utopia setting (which is, in reality, another part of the Singularities universe). All these games had been run before, and the plan was to continue to hone them based on the feedback from the players. As well as that, I resurrected my Conspiracy of Shadows game called 'The Fall of House Atreides', unsurprisingly set in the Dune universe created by Frank Herbert. The reuse of scenarios ended up being for the best, as I ended up being at a Conference in Manchester for the two days before the convention, something that wasn't conducive to last minute preparation. I was, unusually, fully prepared with printed scenarios ready by Tuesday night before the convention. Definitely a first for me. I arrived on Friday night, just as last orders were called, having asked Graham (Chairman-for-Life of Furnace) to make sure there was a pint of Guinness waiting for me on arrival. We had a quick catch up, and then I got on with the pressing business of assembling the badges. Big shout out to Steve Ellis here for helping me after everyone else had gone to bed, right up to the point we got chucked out of the bar. I finished around 1am, which still left me with more sleep than usual with the kids! Saturday morning dawned, and we started set up. I'd agreed to cover the desk in the first game slot as I usually don't run a game in that time, using it to catch up. However, with the usual suspects for that catch up having to pull out (@tsoilkovsky and @ottomancer), I was mainly thinking of reading scenarios and relaxing. Captured a video of the opening speech with my Flip HD camera, and dropped it straight up onto YouTube, and made sure that I was tweeting with the #rpgfurnace tag, because we wanted to let people know what they were missing. Zombicide - a great fill in. First problem hit around 10.00, when we realised the GM for one of the games hadn't yet arrived. We finally got an email from them apologising half way through the slot, despite them also sending up something in the post that indicated they knew they wouldn't make it the day before. We didn't have any spare GMs or games, so I offered the players the chance to try some of the boardgames that I'd brought. 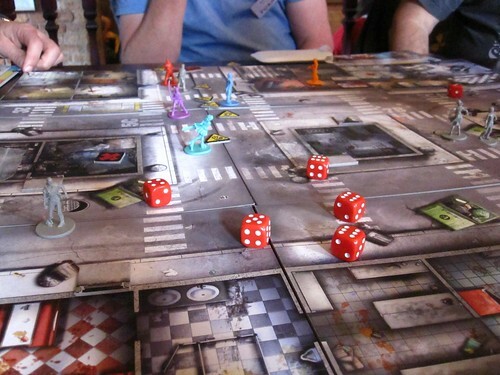 They picked Zombicide, a game I bought from Kickstarter that hasn't yet hit general release. This is a cooperative zombie horror survival game that I've discussed previously (due out November around £58 RRP). They quickly got into it, and we completed a big scenario in around two hours, and great fun was had by all. Indeed, had Jim from Patriot Games have had copies then he'd have sold to at least three people. The important thing is that the players enjoyed themselves, and we didn't feel like we'd let them down as a committee. The afternoon brought my first game, "In a Strange Land", the Utopia scenario that I'd previously run at Continuum. I really enjoyed that game, and was excited about the chance to do it again. Some friends were playing - Tom for example - who I was certain would enjoy it. Unfortunately, the experience was marred by some of players feeling cut out of time in the spotlight. I could feel the frustration, but couldn't see an easy way out of it (it's somehow harder to consider cross words with a player if you're one of the organisers, as it could taint the whole convention). Fortunately, after a break mid-way through things stepped up a gear as two of the players decided to force a change. This seemed to work, and I think people ended up satisfied at the end of things, but it left me with a bad taste. I was incredibly down after the game, and a bit shaken in confidence, as I hate not delivering for players and it's something I rarely have to deal with. However, thanks to some kind words and a review of what went wrong with Matt Nixon in particular I was back in a fit state to run by the next slot. This was meant to be the first Singularities scenario that I had ever written, but that wasn't to be as I had no sign ups. A couple of games had suffered the same fate, the curse of Saturday night, so we dug out my boardgames after grabbing a pint. We started with the new Junta: Viva el Presidente, a reworking of the old classic game Junta. This captured the essence of the sprawling original but plays out in under an hour with very simple mechanics. And sunglasses for El Presidente! It was fun, and I'd like to try again. I was bluffed out of victory by the use of a spy card - rather than attacking my chief rival, I went for the former president who was planning to attack me. Great fun. After this, Zombicide came out again, with the same scenario. 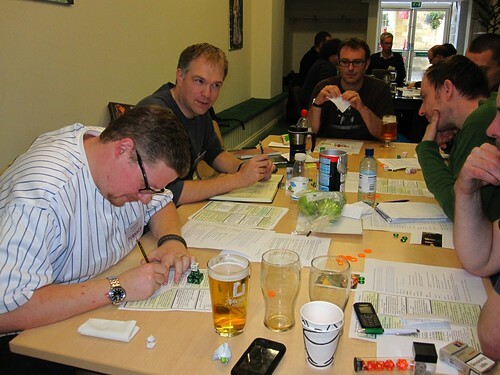 In the time that I spent getting a pint, one of the players from the morning session had taught the others the basics which is a good endorsement of the way that the game works. We played it ruthlessly, had a few hairy moments solved with a Molotov cocktail, and managed to play the scenario out in 90 minutes. The more that I touch this game, the more I like it. Sunday morning is the slot that I run an collaborative 'indie' style game. In this case, the game had co-creation, but some great conflict between the members of House Atreides. It ended messily, and Thufir Hawat was revealed as the Harkonnen Agent responsible for the fall of House Atreides. Good stuff, especially when the players got stuck in. 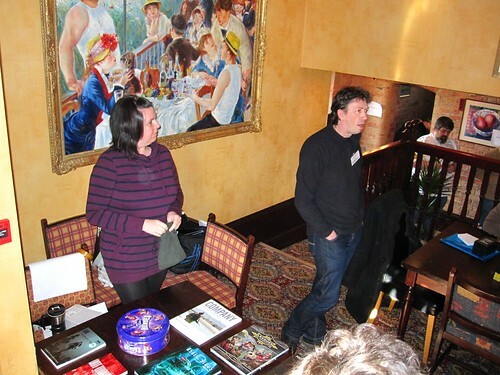 The raffle went well, with quite a few happy people grabbing games that they wanted when their ticket was drawn out. I was happy that we could keep this, especially as we had dropped the free food on Sunday afternoon as the cost had gone up enough to have forced us to put the con-ticket price up if we'd have kept it. The raffle and free coffee & tea are part of the Furnace experience. Sunday afternoon brought the second running of the second game I had written for a military sci-fi feel for use in Singularities, featuring 'Houllier's Heroes', a group of Terminator-style bodied cyborgs carrying out a punitive strike against an enemy world. It started slowly, but gradually the players really got into it, grabbing at action. Kudos to Keary for this, as he helped to drive the game from planning into action. I have number of highlights in my head from this including a vicious battle with fusion, gravitational and coherent radiation weapons in the main corridor of a lightchaser STL starship, the commandeering of said ship, and then the manipulation of an entire planetary population through clever social media activities that resulted in total victory for the players! It was great catching up with friends, although a few people were noticeable by their absence - @tsoilkovsky, @ottomancer and Dr Moose especially. My only regret is the fact I couldn't make it there earlier on Friday night, as there's definitely a social vibe in the pre-con meet-up. 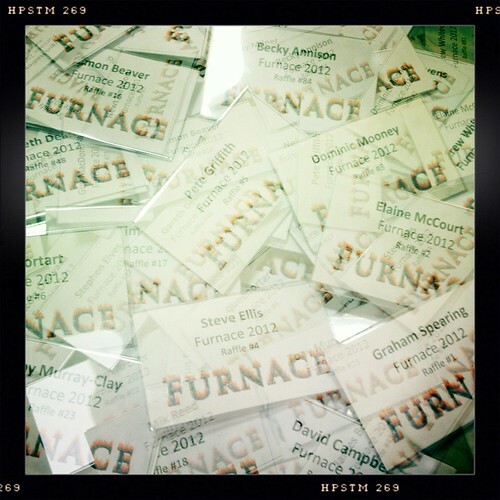 I'm looking forward to Furnace 2013, just have to check how many badges we got back to make sure we don't have to buy more!